In 1829, the Exeter Manufacturing Company erected its textile mill on the eastern bank of the Squamscott River; the largest building in town. 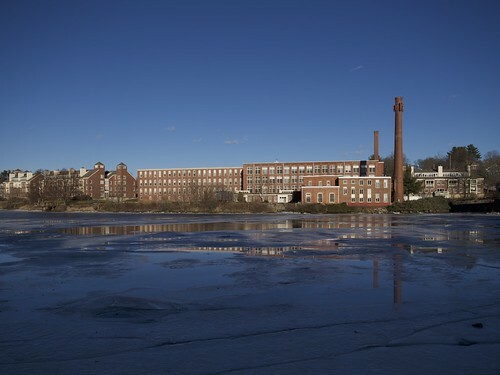 The industrial revolution in New England had proven that such mills could be wildly profitable, and to the local investors it was well worth the money spent. The bricks used in construction were locally purchased, but the machinery was largely imported from England. Power was provided by the Exeter Mill and Water Power Company, which had spent the better part of the previous year buying up all the smaller mills upstream on the Exeter River to ensure the new mill, would have enough power. With four huge water wheels, the mill was entirely run by water power until the 1870s. The mills closed in 1983 and were converted to the present apartments.